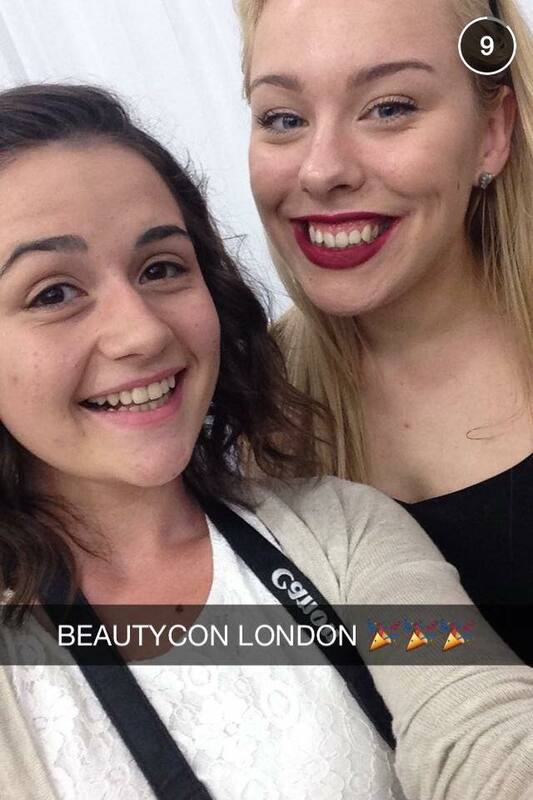 Becca text me a month of so ago purely saying 'BEAUTYCON. LONDON.' and I was instantly SO excited. 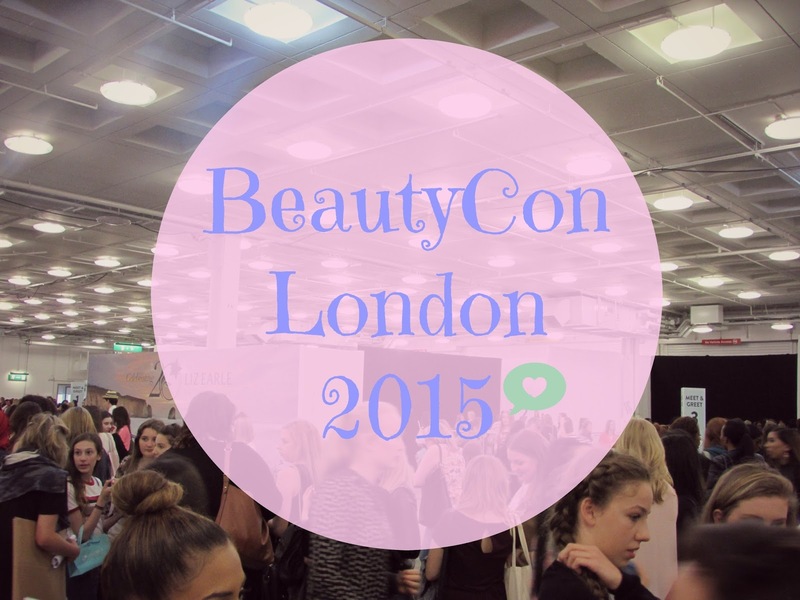 I had watched people's videos and read blog posts about the BeautyCon events in America and now it was finally coming to England, I knew we had to go! 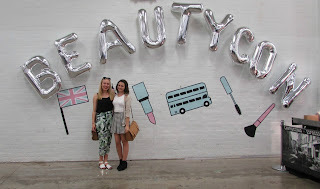 So on 23rd May, Becca and I had an hours sleep then left at midnight to get a coach from Cornwall to London, ready for BeautyCon London at the Olympia! 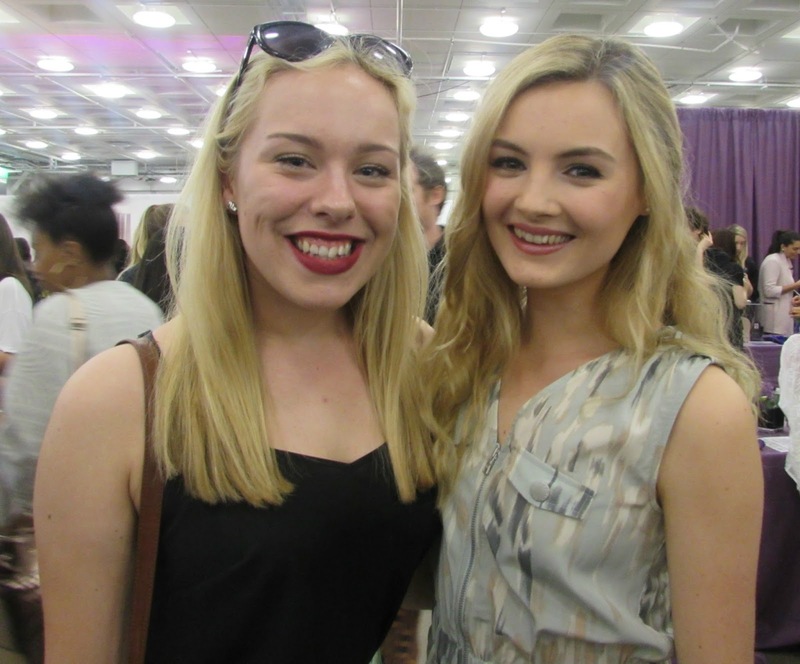 The Olympia was filled with amazing balloons, beauty stalls, meet and greet areas, a grand stage and of course hoards of gorgeous fellow beauty-junkies! We roamed the venue, checking out all of the stalls which included Liz Earle, Benefit and Crown Brushes to name a few. Although all of the stalls were packed with people, it was nice to just have a look and take everything in; I kept saying to Becca that I felt like I was dreaming, not only because I was operating on three hours sleep, but because it was very surreal for me, a young blogger from little ol' Plymouth in big town London surrounded by some of my greatest blogging influences- it was amazing. We queued up to meet Tanner Zagarino and Teala Dunn; they were both incredibly sweet, despite security asking me to quickly move on, they both asked me how I was, gave me hugs and took photos with me. I was near the front of the queue and I walked past a hour or so later and they were still stood there meeting people- they must have been exhausted but they still treated everybody so nicely. Next we met Fleur from FleurDeForce which I was incredibly excited for- I've been watching Fleur's videos and reading her blog for years now and she is such a huge inspiration for my blog, channel, and personal style! Of course, I knew she was a very pretty woman from seeing her videos and photos but I was blown away by her beauty when I saw her in real life- she was glowing and just gorgeous. As well as being so down to earth and lovely. I wanted to ask her all about her dogs because I'm kinda obsessed with them but apparently that's "lame"??? 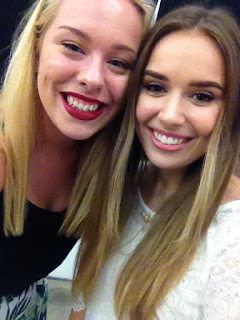 Anyway, we had a nice little chat and I was extremely happy with finally meeting Fleur! I also met Suzie from Hello October and Emma Pickles who were also amazingly lovely (ok we see a trend here.. EVERYBODY WAS SO SO LOVELY ahh). 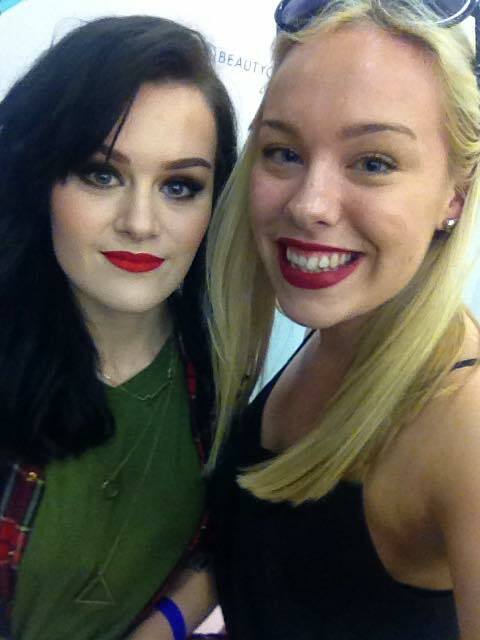 They were both so gorgeous and their makeup (eyebrows in particular) was so on- point! It was so nice to chat to them, as if we were old friends- it really put me at ease. We had been on the look out (in the least stalker-ish way) for Lucy and Lydia all day as Becca and I are huge fans of their YouTube channel. 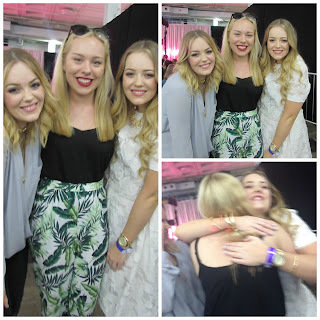 When we bumped into them they were just THE sweetest girls I have ever met. They were full of giggles, hugs and loveliness. 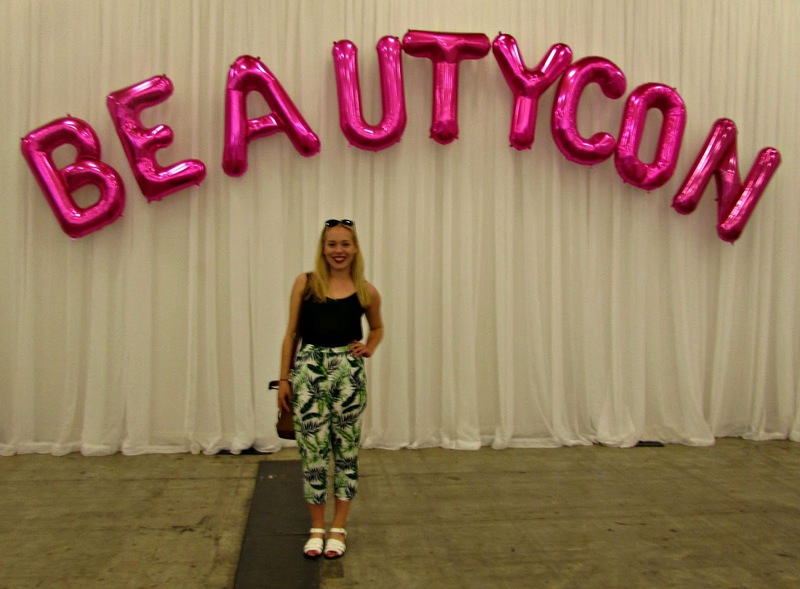 We all chatted about fashion, BeautyCon and Disney. We also caught them again as we were leaving and they gave us huge hugs. I honestly can't say a bad thing about these girls, they were so down to earth and I just want to be their best friend please, thank you! After eating a bag of chorizo flavoured crisps (...sorry Sam!) 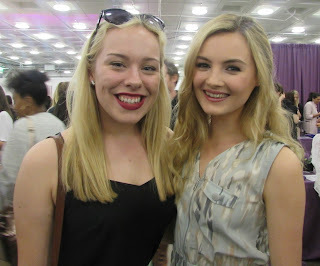 I spotted Sam Chapman from Pixiwoo and went over to say Hi! She was also very gracious and was so genuinely happy to see us! Sam (and Nic who was unfortunately unable to attend) are huge inspirations to me too, not only as fabulous bloggers/ Youtubers, but as fantastic makeup artists, entrepreneurs and mothers. 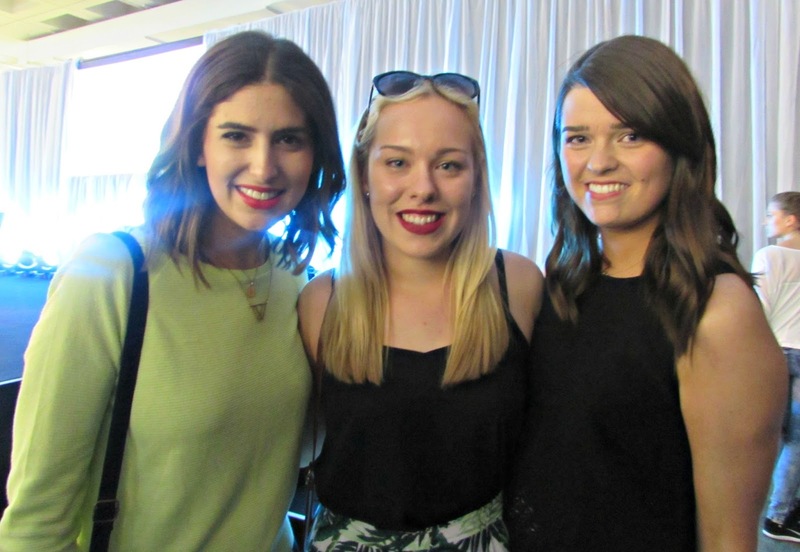 Its so cool to meet people I look up to who are so successful- it has definitely made me more motivated to put more effort into my blog and channel, who knows- maybe I'll be like them some day. 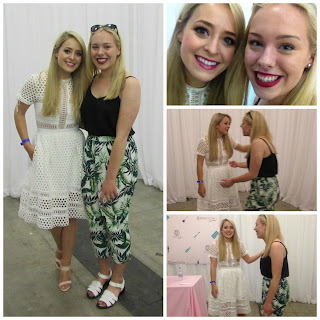 Niomi Smart is one of my absolute style icons- I just adore everything she wears! It was so nice to bump into her... I just had to ask where her gorgeous playsuit is from! Again, she was so delightful to meet- such a sweet girl. Look at my face in this photo... I was fangirling big time inside. Lily and Anna are both my absolute favourite YouTubers and bloggers- their content is so great. I am especially obsessed with their Beauty Chats and their vlogs (I totally just spotted myself in Lily's latest vlog of EveryDayMay too... WIN!). I was so excited (and nervous?!) to meet them and they were so humble and friendly. I also want to be their best friends too haha! We also watched some terrific panels where my favourite bloggers talked about topics including beauty, blogging and general life experiences, sharing tips and helpful advice which really inspired me and as I said before, has truly motivated me to carry on with this blog as I would love to achieve half the success of these inspirational creators that I witnessed at BeautyCon. I had the BEST time at BeautyCon London, especially being accompanied by my best friend, Becca, who never fails to make an experience enjoyable. 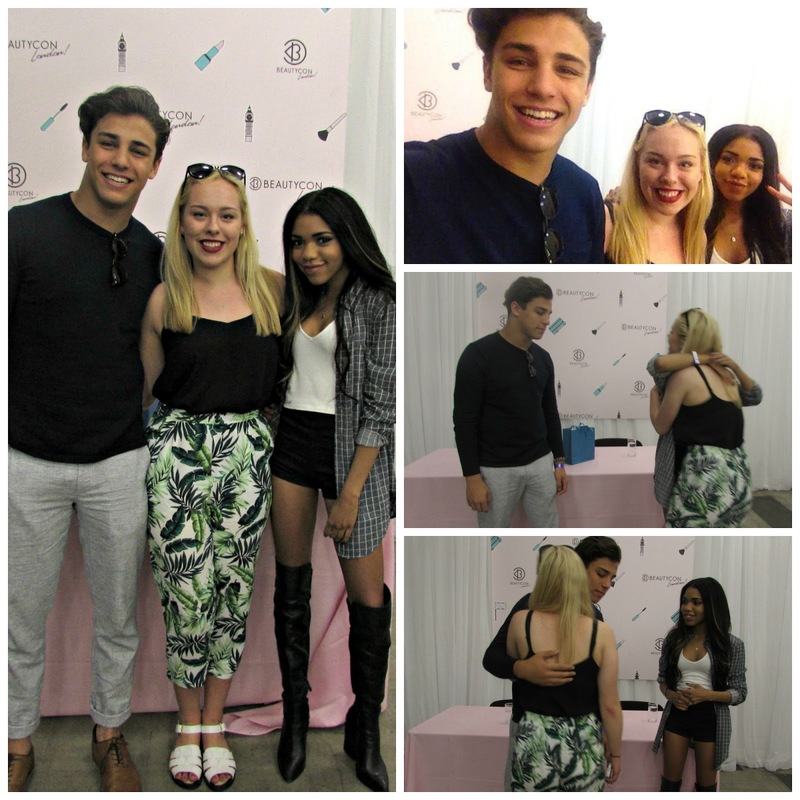 It was such an awesome, special experience and I can't wait to attend the next one! Disclaimer- Thanks to Becca for letting me use all of her photos as I was too lazy to carry my heavy camera around London.